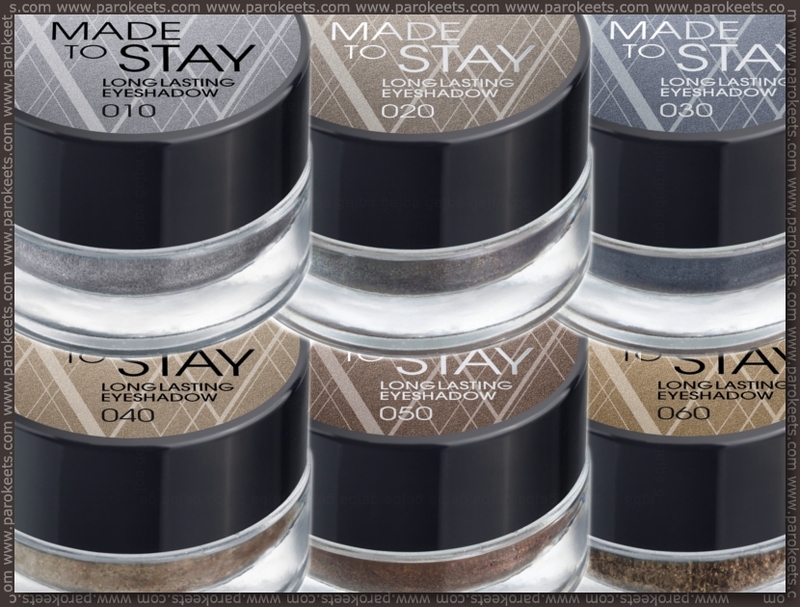 The Made To Stay Long Lasting Eye Shadows in six shades for for Euro 3.90 each! I wondered how I didn't see them before, think they are out since late 2011. Tried all six shades on the back of my hand and decided to buy the Lord Of The Blings, a metallic golden silver shade. I mean it was only for Euro 3.90, so could have bought them all, but wanted first to see if I like the texture and the feel of them on my eye. These cream eye shadows are quite thick and fairly smooth. They all have either a metallic or very shimmery finish and I find them all somewhat cool in colour. Think you could apply them with your finger, but I would recommend to apply them with a a brush. They remind me bit of my beloved Bobbi Brown Long wear eye shadow. Although they are slightly larger than BB's cream shadows, in jars with wider openings so easier to use; they're nearly identical to Maybelline Color Tattoo jars. The eye shadow doesn't smudge and really stayed put all night long, even the next day, after removing all my make up night before!! This little pot will last a long time, so don't think that I will need to repurchase any time soon. Don't really think that I will repurchase any of the other colours, because the to dark for me and everyone knows that darker colours will make your eyes look smaller, and this is not what I want. Of this particular shade, I found the metallic effect is not overwhelming, but very elegant and made my eyes really stand out. So all in all, given the price they are really good! First I applied MAC cream colour base in pearl. Next I applied over the half of my lide the Bobbi Brown Long wear eye shadow in sandy gold . On top of this eye shadow I applied the Lord Of The Blings smudged the two colours together. I applied the Lord Of The Blings also on my lower lash line. I finished the look with the Bobbi Brown Long Wear Gel Eyeliner in Chocolate Shimmer Inc. Next I applied two coats of 17 Wild Curls - volume mascara. Six eye shadows with a high pigmentation for the ultimate metallic shine effect! The soft cream texture is easy to apply and lasts for an extremely long time – without settling in the crease of your eyelid or smudging! 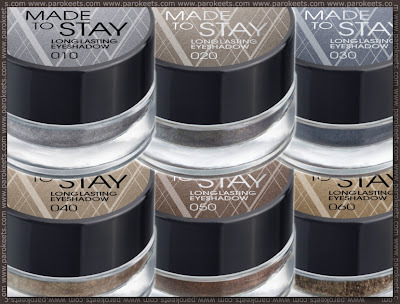 Breathtaking looks, effortlessly created with the Made To Stay Long Lasting Eye Shadows by CATRICE. Have you tried Catrice Makeup yet? I'm jealous! this color looks gorgeous!! PS - just found your blog! I haven't but I'm all ready to try catrice now...only if it is available here!! Thanks for stopping by and following and I'm following you back, of course!! Hi there, I've just come across your blog and I'm lobing it! it's awesome. I'm now a follower! :D I'm actually really into cream eyeshadows at the moment, they're easy for all over long lasting colour. Nice make up, I love the colors you used, it looks especially good on you. You are really talented and have pretty features! Your blog is lovely and I am a new follower! 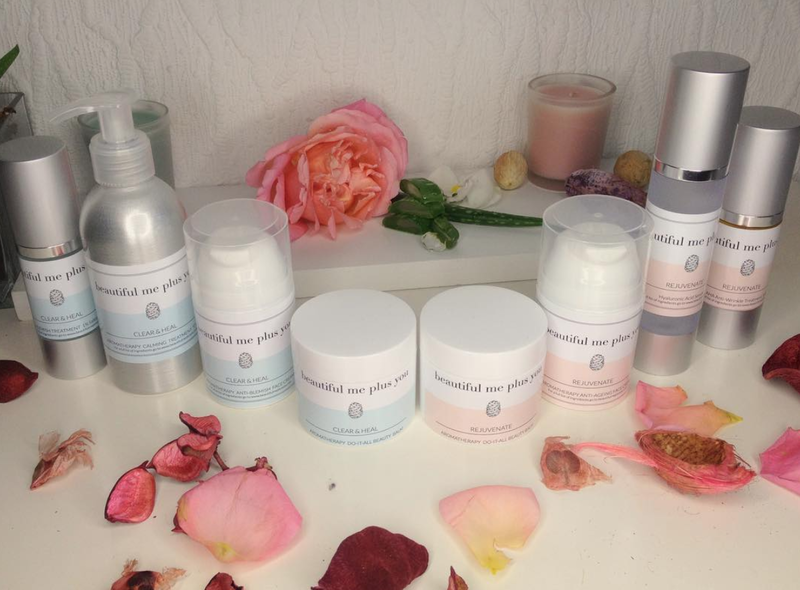 Hope you will like my blog and follow back! Looks really nice, gotta try it! Lovely for you to have commented on my blog Marina - and it's funny the Austria/Dublin connection :) Your blog is great & the catrice shadow is sparkly & fun...I bought the Lord of the Blings for my sister and it's a good buy. Must get some for myself!